Welcome to Eagle Animal Hospital and Pet Resort! 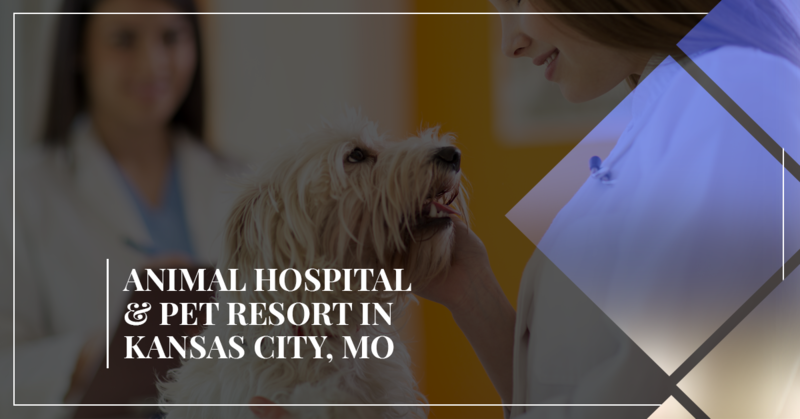 As Kansas City’s Top Rated Local® veterinarian, our team of animal care specialists work together to provide your family pets with care that is tailored to their individual needs in our spacious, state-of-the-art veterinary care facility. As one of the very first animal hospitals located north of the Missouri River, we have provided Kansas City and the surrounding areas in Northland with exceptional pet care services for more than 60 years. Click here to read about our founding under Dr. Tom Eagle in 1946, and explore the vibrant history of our veterinary facility. With seven highly-skilled and dedicated veterinarians and an immense support staff full of caring and compassionate animal lovers, our entire animal care team is wholly committed to providing your pets with the utmost care and medical expertise. We offer a wide variety of animal care services, making our facility so much more than just an animal hospital. Along with our general veterinary services, we also provide pet boarding in our state-of-the-art pet resort, doggy daycare, mobile veterinary services, pet dental care, pet wellness services, animal health care services, and so much more. The health and happiness of your pets is our priority, which is why we have built our practice around one fundamental philosophy: to provide optimum individualized pet care for our clients’ pets so that they may live happy and healthy lives. As pet owners and animal lovers ourselves, we are deeply committed to treating each and every pet as if they are our own while addressing their specific needs with excellent, warmhearted veterinary care. Part of what sets us apart from the rest is that we understand that optimal pet care involves many different facets. This is why we have developed our animal hospital to be the single source in the Greater Kansas City region for exceptional animal care in one convenient location. Your pet’s health and happiness are our priority at Eagle, which is why we strive to make our animal care services as convenient as possible for our clients. Placing all our pet care services under one roof allows us to offer a plethora of health and wellness treatments, as well as general pet care services. Not only is this convenient for our clients, but it also enables the animal care we provide to be much more efficient, collaborative, and effective. After undergoing a recent expansion of our Northland animal hospital facility, Eagle Animal Hospital now boasts a sprawling 10,000 square-foot state-of-the-art facility, complete with indoor and outdoor amenities to support all of our veterinary services. This means that we house everything from general pet wellness exam rooms to exercise rooms, to our diagnostics area and surgery suites, to pet resort suites. We are able to use our veterinary center to its fullest by providing a variety of pet treatments and health services without feeling overcrowded. This is great for those whose pets are weary or timid around other animals because the facility’s layout is vast, spacious, and designed with animals’ needs and behaviors in mind. Take an interactive virtual tour of newly remodeled facility by clicking here. Placing everything together makes it much easier and convenient for our clients to bring in their pets for everything from routine wellness exams to pet surgeries. What is more, our clients gain peace of mind in knowing that our team works collaboratively to provide the best care for all of the pets we see, no matter how simple or challenging a procedure may be. We also understand that when your pet is not feeling well or is in pain, running from one facility to the next places additional stress on a pet, especially for those like cats who are not as comfortable for familiar with riding in vehicles. Offering all veterinary services in one animal care center cuts down on travel time, which can make a huge difference in care depending on each animal’s unique needs. Whether you have to be away from home for short or long periods of time in a day for work, school, play, or to run errands, you don’t have to worry about leaving your furry family member at home alone. At Eagle, we offer doggy daycare because, as pet lovers with pets in our families, we realize that providing pets with a safe, comfortable place to stay while their human parents are away can benefit both the pup and the parent. No dog parent likes leaving their furry family member at home for long periods of time and, however, many can’t take their pets with them to work, school, or even out to run errands—especially on hot, humid summer days here in Kansas City. Therefore, our skilled animal care team will look after your pet and provide them with love, attention, and even playtime while you’re taking care of your responsibilities. This is a guilt-free way to handle your tasks away from home without feeling sad that you had to leave your fur baby at home. As with our pet daycare and doggy daycare, we also have a pet resort which is equipped to handle your pet for a longer stay while you’re out of town on a business trip or on an international getaway. We wanted our expanded facility to be able to house cats in a quiet, comfortable space that is separate from the dog suites. Additionally, we expanded our dog boarding area to house 7 luxury suites, 28 deluxe suites, and 14 studio pet suites where dogs can be dogs. We want your canine companions to live in luxury, comfort, and pure happiness during their stay with us, so it was important to add this expansion to our existing animal hospital. Click here to take a virtual, interactive tour of our pet resort so you can see which room best suits your pet’s individual needs. Is your dog a Chiefs fan? How about a Jayhawks fan? Or maybe your precious pup prefers a princess suite? We have all three options and more available for booking in our luxury suites. What’s more, all of the pet suites and our cat condos are temperature-controlled, and come complete with window views. We also encourage our clients to pack their pet’s favorite toys and blankets for their stay. Just as with humans, your pet’s dental health is an essential aspect of their overall wellness. While it may be something that you don’t think about when you ponder your pet’s health, it is just as important to maintain your pet’s healthy teeth and gums. When plaque builds up on their teeth, it can cause serious dental problems as time goes by, which can affect their overall health. Swollen gums and other tooth and gum issues can be quite painful for your pet, too. Plaque builds up easily on your pet’s teeth, so checking their teeth regularly, scheduling them for dental exams when they come in for wellness visits, and maintaining regular teeth cleanings can help your dog or cat live healthier and happier lives. These are just some of the incredible benefits you and your pet may gain from bringing your furry family member into us here at Eagle Animal Hospital. Now that you have read some of the amazing benefits you and your pet may gain from coming to us for quality animal care, read the useful pet tips listed below for our clients and readers to utilize to optimize their pet’s health and wellness. As with humans, dogs also require a daily intake of minerals and vitamins. While many natural dog treats provide your pup with some of the nutrients they need for healthy body function, adding these healthy foods as snacks will give them a healthy boost of nutrients. Blueberries: These healthy blue snacks provide your pup with vitamin C, fiber, and antioxidants which supports their immune system and are low in calories. This fruit is perfect for carrying while walking your dog or can easily be added to their kibble for a vitamin boost. Carrots: This crunchy, low-cal veggie is a great source of fiber and vitamins that your dog needs for strong bones and a healthy coat. Pups love chomping on carrots that help clean their teeth and gums with every bite. Apple Slices: Apples are a great source of fiber, vitamin C, and calcium. Like carrots, these crisp treats help clean your pup’s teeth with every bite. The caveat here is that you must remove the apple’s core along with all the seeds, as apple seeds are toxic to dogs. Apple seeds contain amounts of cyanide which will cause issues with your dog’s digestive system and make them incredibly sick. It’s best to cut an apple into slices or cubes and give them a few pieces in the morning and/or at night. Dog-Friendly Dental Care: There are some great products made specifically to maintain and improve the health of your dog’s teeth and gums. Doggy toothpaste is specially formulated for a deep clean to remove plaque buildup while cleaning your pup’s teeth and gums with antibacterial enzymes that also reduce bacteria. Use either a small toothbrush that you get during your visit to the dentist or pick up a toothbrush made especially for dogs and brush their pearly whites every day or every other day. Chew Toys: Chewing is a great way for your dog to clean their teeth naturally while also strengthening their neck and jaw muscles. Sturdy rubber chew toys like those made by KONG will outlast any rawhide chew and will usually pose no risk for choking. These are great chew toys for teething puppies who can chew and chew to their heart’s content without ruining the chew toy (or your new pair of shoes). Routine Dental Exams: Schedule your pup for routine dental exams at Eagle Animal Hospital to see how well you’re doing at keeping your fur baby’s teeth clean and sparkling. If your pup needs a deeper clean or other dental work to enhance the dental care you’re giving them at home, our pet dentist can recommend further dental treatments. Maintain Your Cat’s Teeth Health, Too! Food with Dental Support: There are a variety of natural cat foods that help reduce plaque buildup on your cat’s teeth by as much as 50 percent. Additionally, feeding them nutrient-rich foods without fillers and byproducts is another great way to support your cat’s dental health. Schedule an Annual Cleaning: Most cats refuse to let their pet parents brush their teeth, so your best bet is to bring them in to see our pet dentist every year to make sure their teeth and gums are in good health. Bringing home a brand new puppy is a joyous and exciting event. When welcoming a new puppy into your family and home, there are measures new puppy parents can take to make their home comfy and safe for the new pup. Here are a few tips for puppy-proofing your home. Get Rid of Clutter – Puppies are some of the most curious creatures and will get into anything and everything, especially during the first year of their life. Furthermore, puppies begin teething in the first few weeks of life and continue teething up through six months of age, although some dogs will continue teething after the six-month mark. These little fur babies explore with noses and mouths, so anything in their path is subject to being chewed on. While this can lead to damaged belongings, it can also be hazardous for your puppy should they ingest something that could choke them or that is toxic. Clean up all the clutter before bringing your puppy home and limit clutter build up thereafter. Invest In Secure Trash Cans – Puppies will follow their tiny noses anywhere, which often leads them to the trash can. Trash cans are full of materials and foods that may be toxic and highly dangerous to puppies. Some items of concern include those that may be a choking hazard or which can cause an internal obstruction such as plastic bags and chicken bones. There are a number of foods that get tossed into garbage cans that are also toxic for dogs, including avocados (especially the skin and pit), peach pits, raw poultry, grapes, onion, and artificial sweeteners. Therefore, always keep all trash cans covered and secured to avoid ingestion of toxic materials and substances. Use Outlet Plug Covers – It never fails — puppies almost always investigate electrical plugs within the first few days of bringing them home. Their close proximity to the floor puts electrical plugs right in a puppy’s path, and when they go to check one out by licking or pawing at it, they are at risk of becoming electrocuted. Cover all electrical plugs that aren’t in use to protect your puppy from injury. Hide and Cover Electrical Cords – The same goes for electrical cords. Puppies will chew on electrical cords with their sharp puppy teeth and make their way to the wires inside in an instant. Keep these hidden and out of reach from your puppy. Do you have questions for our veterinary care specialists? Give Eagle Animal Hospital and Pet Resort call at (816)272-8072 or reach out to our animal care team online. We look forward to hearing from you!